The Shimano naming system is actually kind of punk rock because it’s very clear where their priorities, and budgets, are. They care about great engineering, not marketing smoke and mirrors. It’s the whole foundation Shimano stands on. Still, I’ll be referring to the SH-M200 as my Trail Stompers from now on. There’s plenty of actual rubber lugs, making the M200 as good off the bike as they are on it–thats saying a lot. The cleat slots are extra long, allowing for plenty of fore-aft adjustment. When I heard about these new Shimano trail shoes a few months ago, I was intrigued. 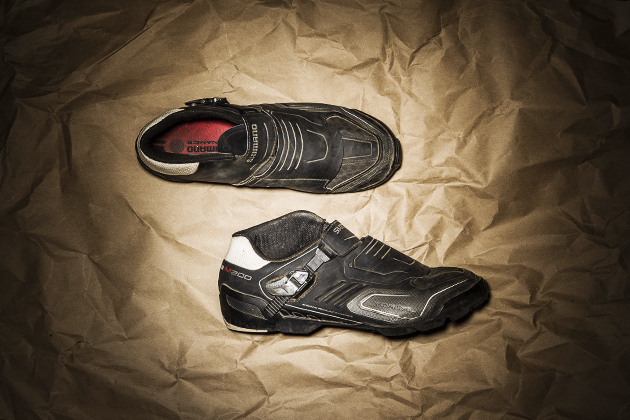 This is because I was, at the time, having a love affair with another Shimano shoe, the XC90. The XC90 is an ultralight, crazy stiff cross country racing shoe designed and built to shave seconds off the clock. I’m the furthest thing from being a racer-type, but the XC90s fit like a glove and provide all-day comfort–as long as you’re on the bike the whole time. Their hard plastic lugs makes walking around in them sketchier than deep-frying a frozen turkey on a porch built from matches. So when I found out that the new shoe would have actual rubber lugs and burlier build, I was in. 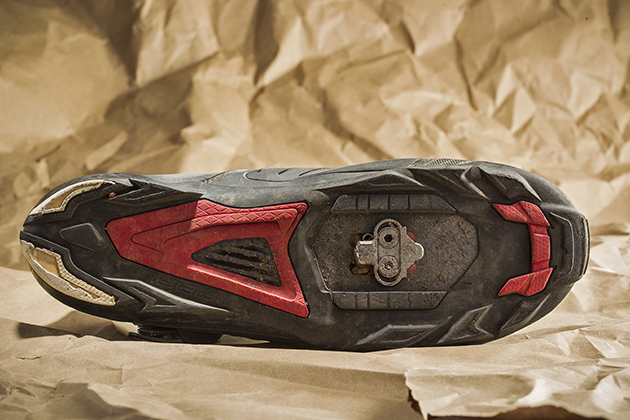 To give the Trail Stompers their stompyness, Shimano added a fair amount of armoring to the exterior of the shoe for durability and protection, including toe reinforcement and an asymmetrical ankle cuff. Even with all its armored exterior, the XC cues are definitely still there. Durability meets performance. Even though I’m not racing, I still enjoy many of the technologies that separated riding and casual shoes in the first place. I get why lace-up skate-looking clipless shoes exist, but they’re not really my bag. I like stiff (but not too stiff) soles, and I like buckles. I like being able to adjust the tension of the shoes while riding. That’s why I love my Trail Stompers. The sole isn’t as crazy stiff as a pure XC shoe, but still performance oriented. It doesn’t stop there, though. True to form, Shimano engineered the snot out of these things. They used their giant marketing arm to create a term for what’s going on in the sole: Torbal. It’s a combination of the words torsion and balance. Clever. Basically, what it’s supposed to do is provide more side to side (torsional) flex than your typical race shoe to account for your body position changing a lot when “getting rad”. 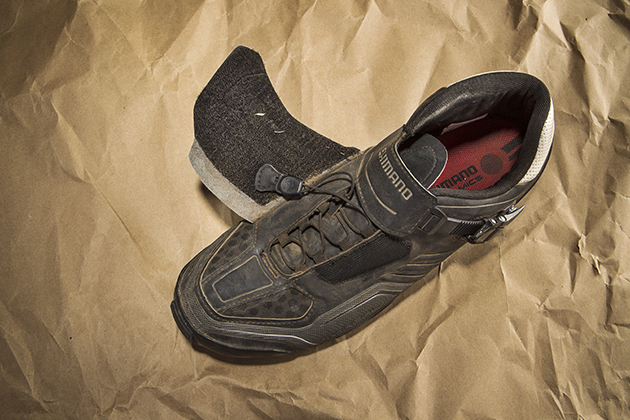 Then, the sole is reinforced with carbon in specific places to provide a solid platform to pedal off. Other places of the sole, like at the toe, aren’t reinforced so that you can still walk in the things. Just kickin’ it. Even though there’s a good amount of protection, Shimano still made room for venting. As far as fit goes, I’m pleased as hell. The quick lace on the lower foot allows for quick and accurate tightening, and once done I rarely need to stop mid-ride to re-adjust. A Velcro storm trooper-looking flap covers the lacing system keeping it tucked away and providing added protection to the top of the shoe. 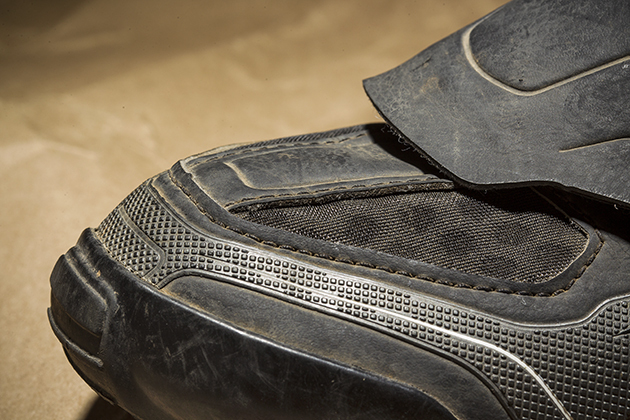 A single buckle takes care of tension at the top of the shoe, and is easily adjustable on the fly–just how I like it. My Trail Stompers don’t quite have the same fit-like-a-slipper feel as the custom-fit XC-90 shoes, but I don’t necessarily think it’s because they don’t have the same heat moldable feature (I never even heat molded my XC-90 shoes). 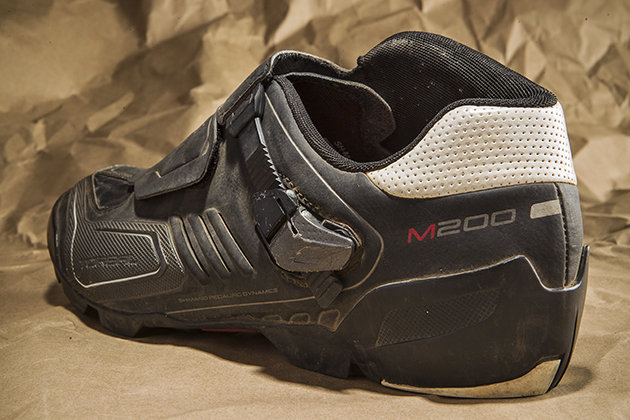 The difference in feel is because the SH-M200 is made out of heavier-duty materials that don’t contour to the shape of your foot quite as much. The end of the quick lace has Velcro on it, so when you’re done pulling it tight you can slap it on the underside of the flap, preventing stray laces. But that’s not really a fair comparison, because these shoes are much, much more versatile than a set of weight-weenie slippers. And for what they are, they have an amazingly contoured and precise fit. I’ve crashed, hiked, forded rivers, kicked stuff angrily, and ridden miles and miles in the very pair of shoes pictured here. They keep my feet happy and footing secure everywhere I’ve taken them, and just as important, they keep on kicking too. As long as they make shoes like this, Shimano can call them whatever they damn please.